Whoa, Karen!! You have been such a busy, busy lady, and I am in awe of the number of cards you've created! They look amazing, and I hope your craft show went well. You go girl!! I hope you sell each and every one, and have orders for 200 more. Oh. my. goodness. 200 cards! Girl .... when you go, you go big! LOL! Amazing - such a GRO-geous (hee hee!) cache of paper yumminess! You are an amazing crafter, and I'm tickled pink that you were able to sell some of your beauties! You get card maker award of the year in my book! Hugs! 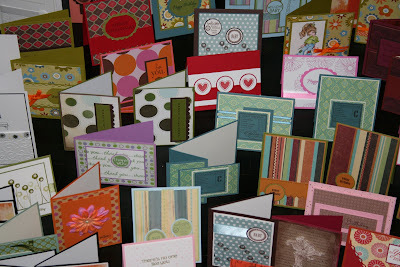 They are beautiful....I hope that you did sell some of them....a great way to share the love!! Wowzer! Karen, you are amazing girl! 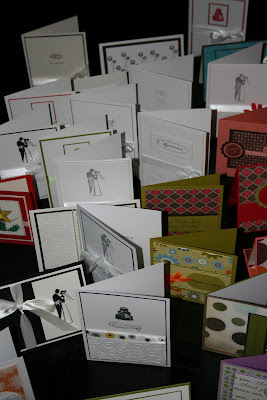 200 beautiful, fantastic Cards! How did you do all that...no sleep??? Anyway, I am in awe of you!! Please, please send me some your mojo. Wowzer Kare Bear...you have been a busy girl....and the cards are beautiful...I'm sure they were appreciated by those who purchased...great job...!!! !